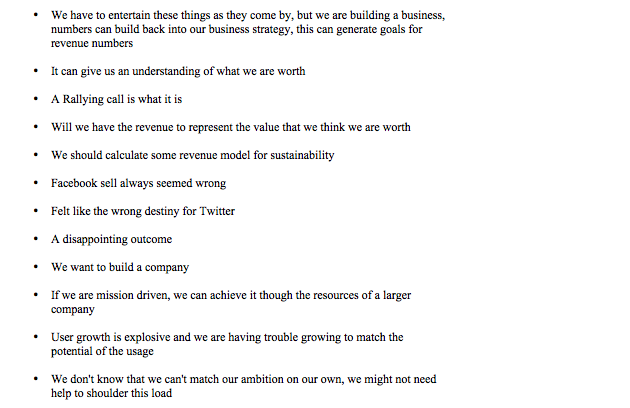 Twitter's Internal Strategy Laid Bare: To Be "The Pulse Of The Planet"
On Tuesday evening more than 300 confidential Twitter documents and screenshots landed in our inbox. We said we were going to post a handful of them only, and we’ve spent much of the last 36 hours talking directly to Twitter about the right way to go about doing that. 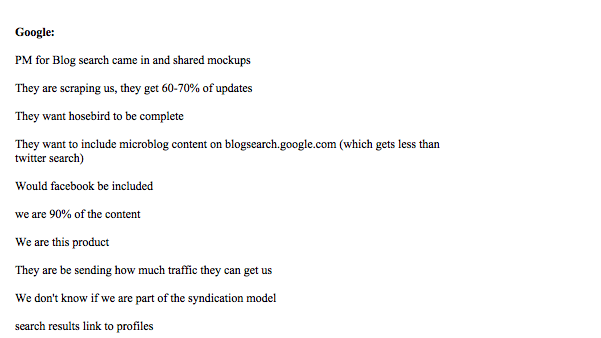 We’ll have more to say on that process in a couple of days. The documents include employment agreements, calendars of the founders, new employee interview schedules, phone logs and bills, alarm settings, a financial forecast, a pitch for a Twitter TV show, confidentiality agreements with companies such as AOL, Dell, Ericsson, and Nokia, a list of employee dietary restrictions, credit card numbers, Paypal and Gmail screen shots, and much more. 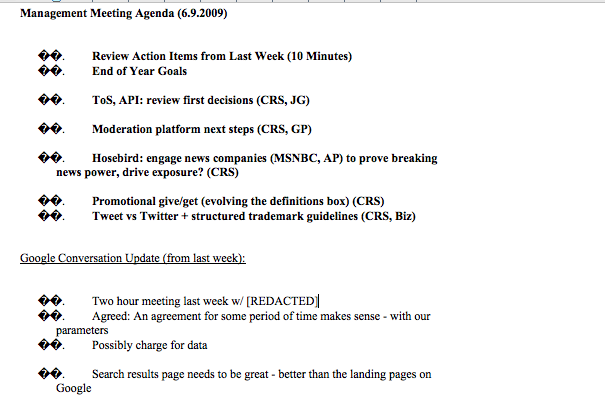 These are the last two documents we are going to share: a subset of the detailed notes from a set of executive meetings that took place between February 12 and June 9, 2009. 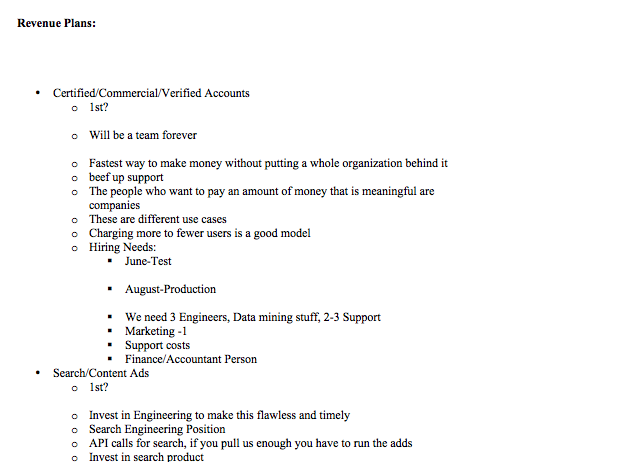 Much of the information in these notes is either personal in nature (new hires, etc.) or too sensitive to share. What’s interesting of the rest we are posting here with our commentary. 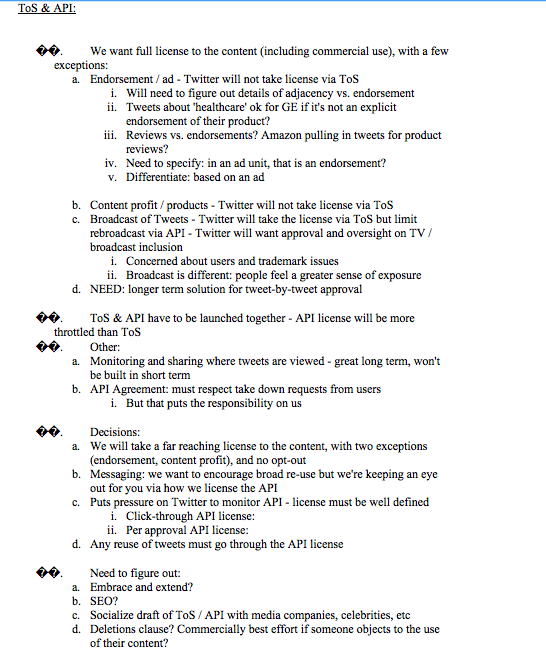 These notes include never-before revealed discussions between Twitter and Google, Microsoft, and others, as well as details of product planning, company goals, employee retention, and new proposed terms of service and APIs. 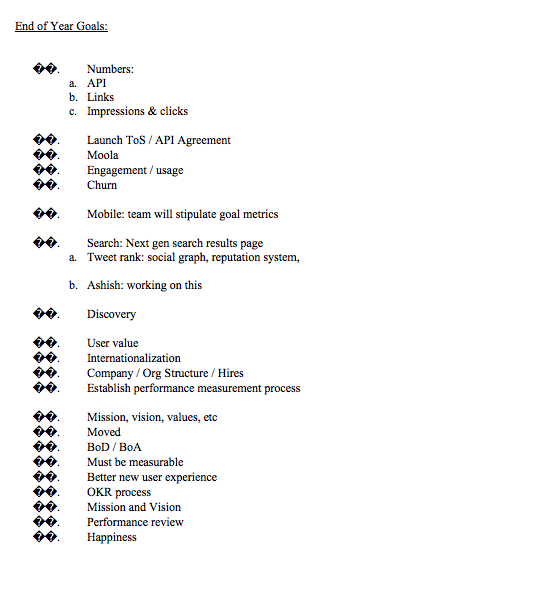 Even acquisition targets such as CoTweet and Twitpic are discussed (and sometimes dismissed). It’s important to note that we have been given the green light by Twitter to post this information – They aren’t happy about it, but they are able to live with it, they say (more on why they did that in our later post). One other caveat – as we’ve said before, these documents are rough meeting notes, not polished documents meant for broad consumption. There are lots of typos and outdated information. But on the plus side, the rawness of it shows the dedication and deep commitment of this team to making Twitter into a world-class company. 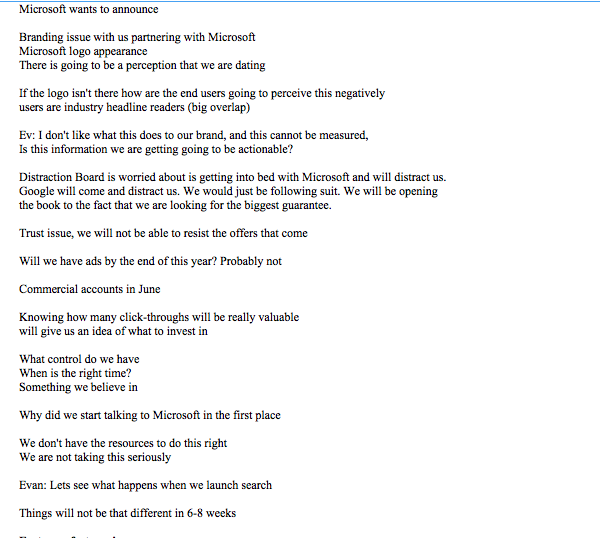 Finally, there are some details about partner discussions, particularly around Google and Microsoft, that we are just not going to publish. Twitter has been in negotiations with both companies around a broad set of transactions for months. But we aren’t going to go into great detail about exactly what has been discussed, or Twitter’s strategies toward those negotiations. So while it looks like there is a lot of detail around those discussions below, the most sensitive stuff has been removed. Let’s start with a key strategy meeting which took place on February 25, 2009. 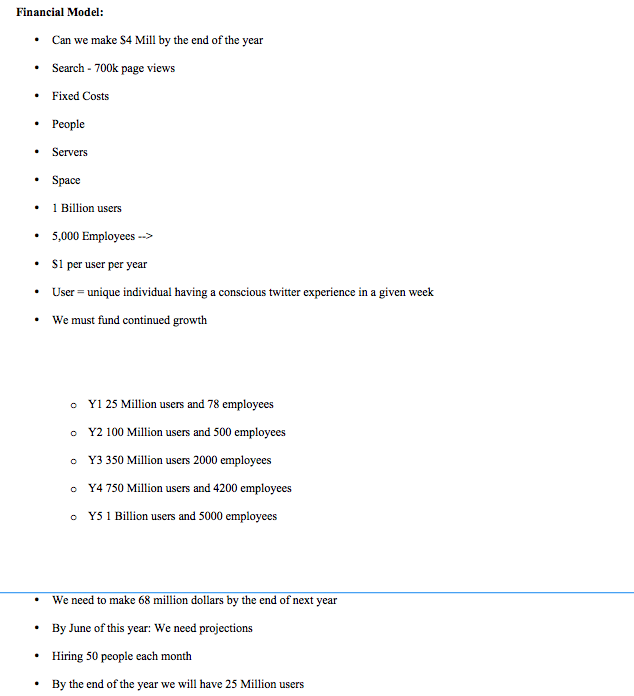 One of the audacious goals laid out in the notes of the strategy meeting is for Twitter to become the first Web service to reach one billion users. 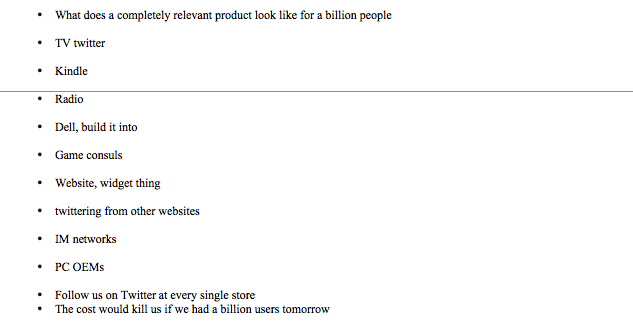 The notes are laid out in bullet points with each one reading like a Tweet: “If we had a billion users, that will be the pulse of the planet.” In the meeting itself, Stone tries to put his finger on what Twitter is by calling it more of a “nervous system” than an alert system. A lot has happened since February. Twitter’s site has gone from an estimated 4 million visitors in the U.S to 20 million, and nearly double that worldwide. 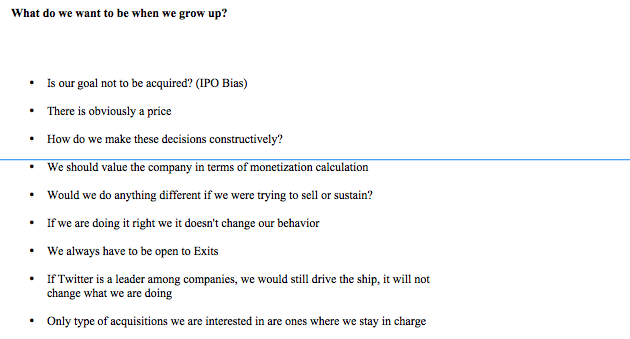 However, the notes provide a rare view into the strategic thinking of the company just before it entered its current phase of hypergrowth. Diddy, Marissa, and Microsoft: Another thing that comes through from the notes is just how much everyone has been courting Twitter. 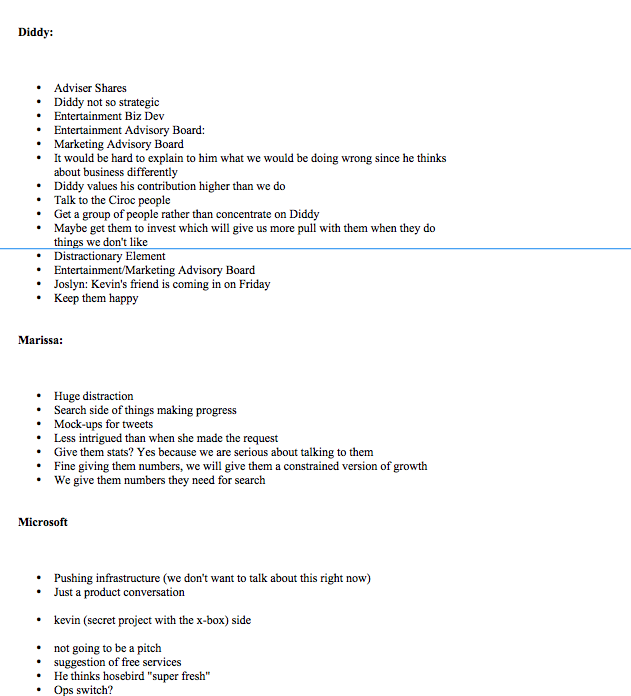 The agenda topics for a Twitter management meeting on April 16, 2009 reads like a who’s who of Hollywood and Silicon Valley: Diddy, Oprah, Marissa Mayer, Microsoft, 4Chan. They discuss giving “advisor shares” to entertainer Diddy, a big Tweeter, but also see him as a distraction. 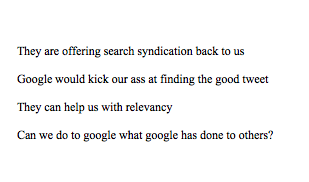 “Diddy values his contribution higher than we do,” read the meeting minutes. In an earlier meeting on April 2, other potential advisors discussed included Shaq and Al Gore (presumably both would receive advisor shares as well). Exchanging Favors With Investment Bankers: On May 26, the Twitter management team discussed choosing investment bankers with the idea that they would engage them “for a year and a half – exchange favors, then use them for the transaction.” It is not clear what “the transaction” is, but it can only be an IPO or an acquisition. Identity Crisis: Let’s return to that key strategy meeting on February 25 (from here on out I’ll try to go chronologically). 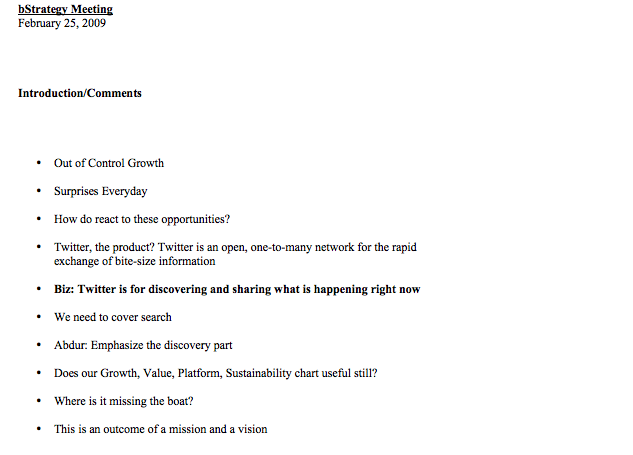 It is clear from the notes that the company was still struggling to define itself: Some stabs at defining the company’s mission included “Twitter is for discovering and sharing what is happening right now,” and “Twitter makes you smarter, faster, more efficient and more powerful.” Below are excerpts taken from throughout the document. The Facebook Threat: The Facebook threat keeps coming back up. 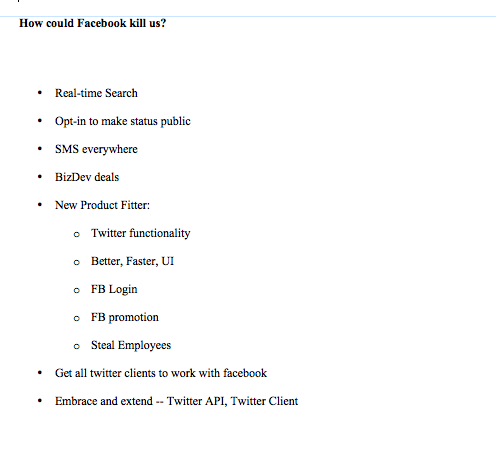 In one portion of the meeting devoted to discussing “How could Facebook kill us?” they list threats such as Facebook adopting real-time search, changing the opt-in options to make status messages public, emphasizing its SMS features, and generally copying Twitter’s functionality and user-interface (all of which have started to happen). Defensive Strategy: The company also considered how best to defend against Facebook. 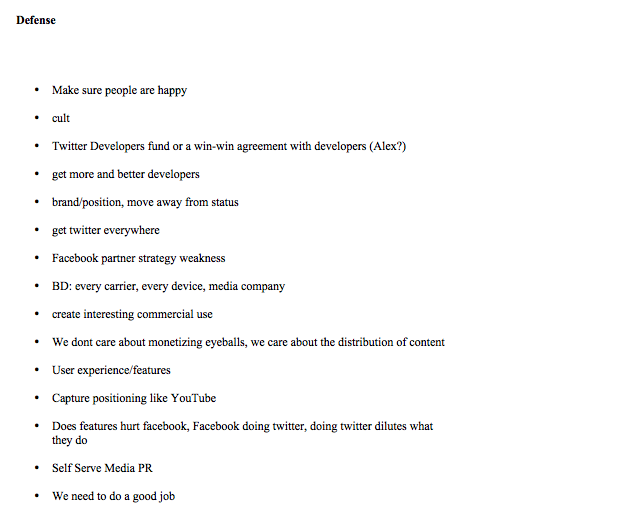 “Make sure people are happy” is at the top of the list, followed by “cult” and “get more and better developers.” Doing a better job and getting “twitter everywhere” seems to be its best defense. 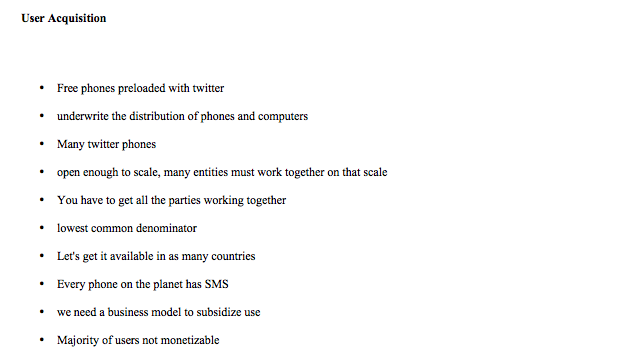 But it is the next business models down the list which start to become interesting. These include Search/Content Ads (with heavy users of the search API being required to run ads), Sponsored Tweets, “Adsense Widgets” (presumably Twitter ads which can run on other sites like Google’s AdSense, and in other apps) and payments. RSS Is The Enemy: The other expense they are worried about is supporting all of the RSS feeds that are migrating to Twitter. 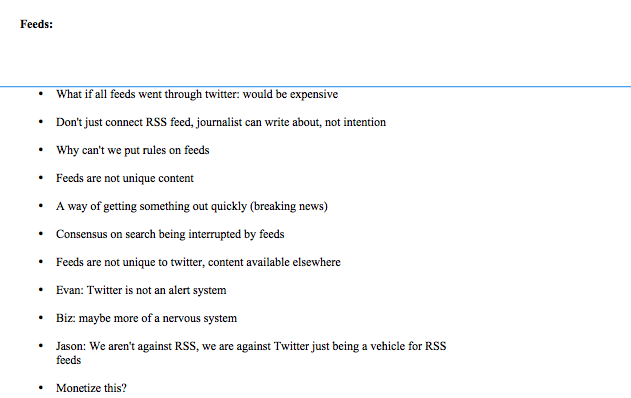 The people who run Twitter definitely don’t like RSS, and who can blame them? 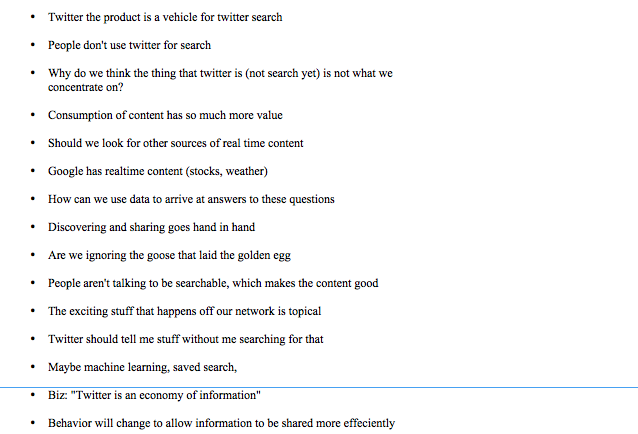 The big concerns expressed at the meeting were, “What if all feeds went through twitter: would be expensive,” and “feeds are not unique content.” (They are also too slow, but that is another issue). 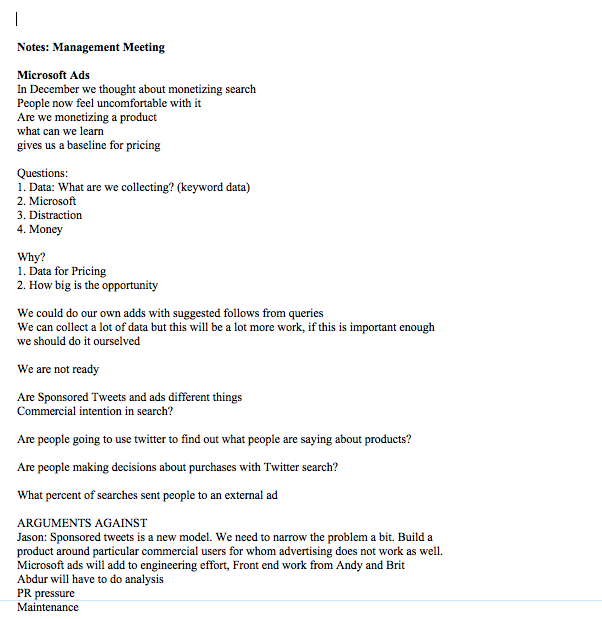 In that same March 12th meeting, Twitter also wrestled with a proposed search advertising partnership with Microsoft. The team was “not ready” and considered this yet another “Distraction.” Worries were expressed that it would strain Twitter’s engineering resources and that any partnership with Microsoft would raise branding issues: “There is going to be a perception that we are dating.” The board was also worried about Twitter “getting into bed with Microsoft.” By the end of the discussion, someone asks, “Why did we start talking to Microsoft in the first place”? Twitpic, Photobucket, Tweetie: At the same time that Twitter was putting off Microsoft and Google, it was cultivating smaller startups. 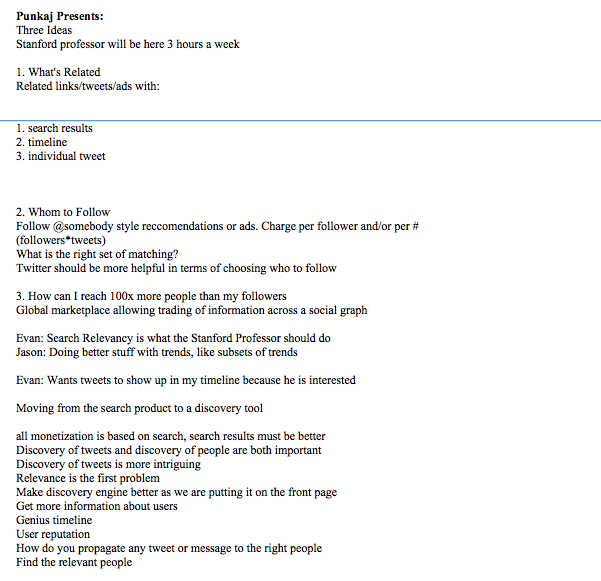 During that same March 12th meeting, one agenda item was “Twitpic- To buy or not to buy (1).” They decided not to, and the next week in a meeting on March 19, they decided to “bless” a competing Photobucket app called Twitgoo. 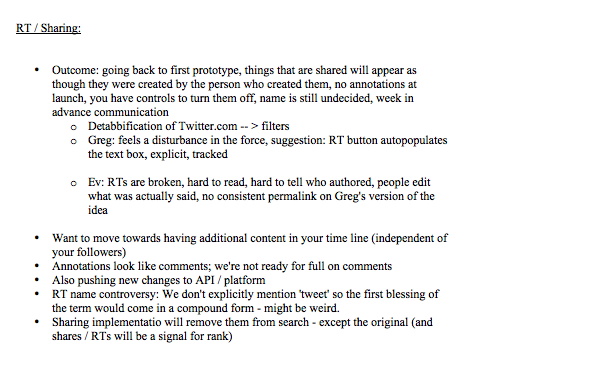 Twitter also decided “we like Tweetie,” the popular mobile Twitter client in a meeting on March 26th. Mogees, R.I.P: You can also see what happens to startups that don’t get Twitter’s blessing. 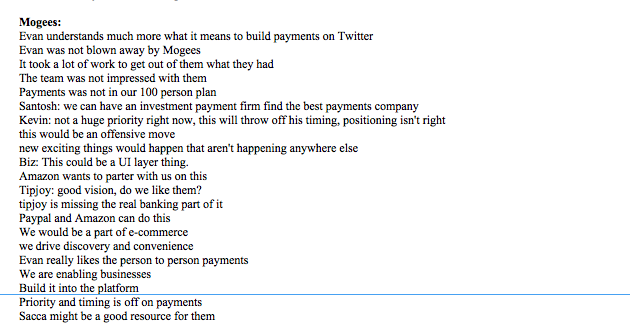 Twitter CEO Evan Williams was “not blown away” by micro-payment startup Mogees in a May 7 meeting because “Paypal and Amazon can do this.” Mogees doesn’t seem to be in service anymore. 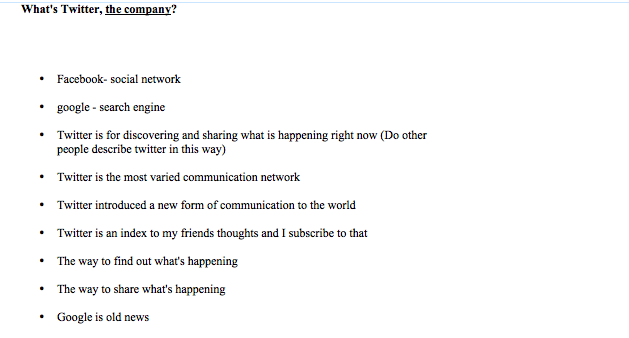 April 30, 2009, Employee Retention (“Happiness Committee”): Twitter’s management meetings also dealt a lot with how to keep employees engaged. 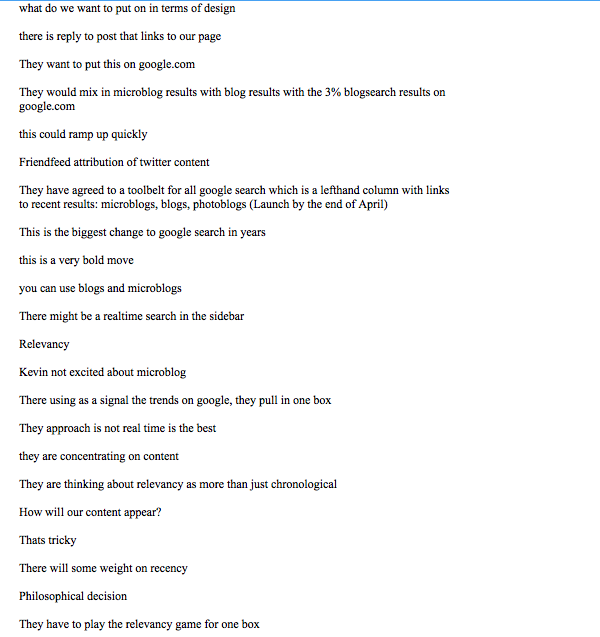 The minutes for an April 30 management meeting talk about recruiting from Facebook and note: “People don’t leave jobs they leave managers,” they “leave situations that are making them sad.” To prevent that from happening at Twitter someone proposed forming a “happiness committee.” That should work. 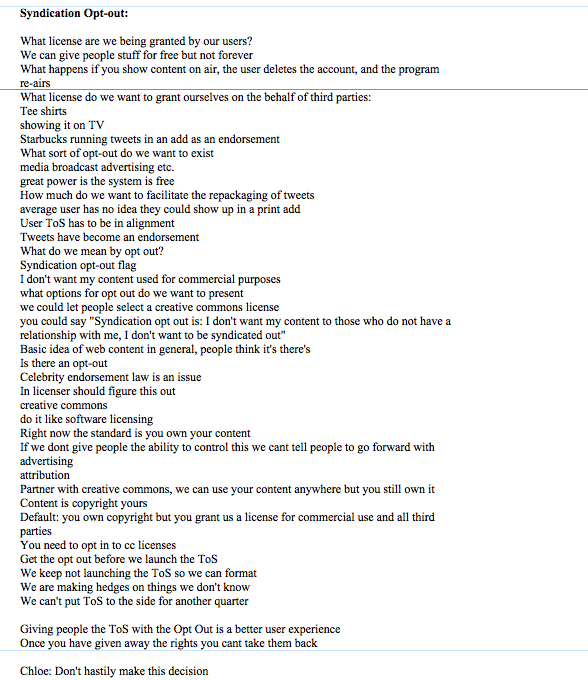 Nothing Is Free Forever: In that same April 30 meeting, the team talked about licensing Tweets to partners: “We can give people stuff for free but not forever.” There was also a fascinating discussion about how users should be able to opt out of having their Tweets syndicated by other media properties such as TV shows. One idea put forward was that your Tweets can only be syndicated by other people or entities who already have a relationship with you. Search as Discovery: Another interesting discussion on April 30 had to do with search as discovery and the work of a visiting Stanford professor. The notion of charging per follower is contemplated. Retweeting (A “Disturbance In the Force): Finally, everyone’s favorite subject, retweeting, was brought up in that June 2 meeting. It looks like Twitter is going to adopt it as a formal feature, but Evan Williams is concerned that retweets are “broken” because it becomes “hard to read who authored, people edit what was actually said.” Well, yeah. There’s only 140 characters, you know.